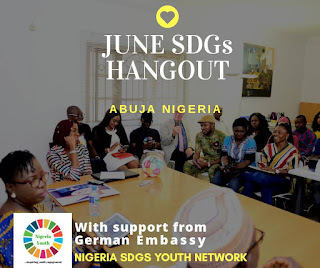 Following May’s edition of the SDGs Story event hosted by the Denmark Embassy in Nigeria, the German embassy in Nigeria is set to host the June’s edition of the SDGs Hangout. Obviously, many young people leverage the Sustainable Development Goals (SDGs), to make the world a better place through little efforts which sums up to significant results; the Nigeria Youth SDGs Network in Abuja remains committed to amplifying the voices of non-state actors who work ceaselessly to actualize the global goals in Nigeria. The monthly #SDGsStory Hangout is a unique platform that brings selected young people together to have robust conversations and enlightening engagements about the SDGs and their contributions, thereto. There is a call to young people, in or around Abuja, who work ceaselessly across various scopes of the Global Goals to be a part of the June edition of the SDGs Story Hangout using this link http://bit.ly/SDGsHangout.